This one was well worth the wait! I had it designed especially for my daughters dog! She LOVES it. We were hesitant to even use it, it looks so nice! It comes from L.G. Potter. I really appreciate that he was able to send me some before pictures! Here are some picture Lewis sent me of the work being done. This is before the first firing. Yes, these are made to order! They are created on a potter's wheel. If you visit the website, L G Potter you will be able to find a description of how these are made. All bowls are made on the potters wheel. 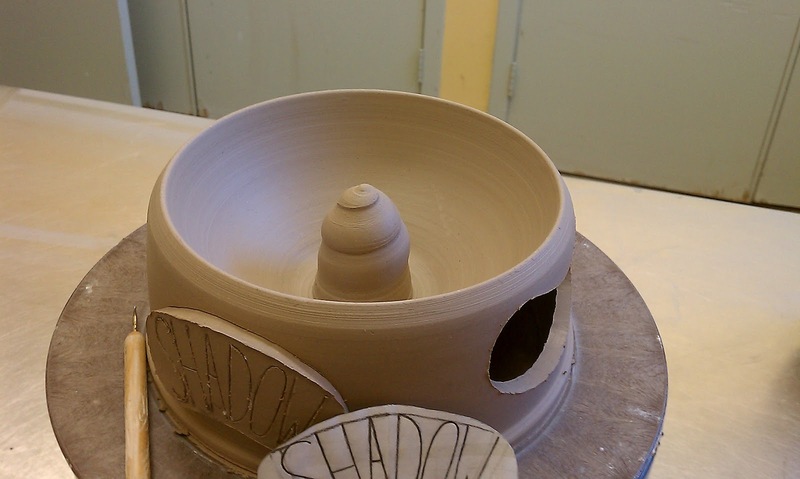 The bowl is formed first and then a cylinder is made for the bowl to set down inside of. The two pieces are then compressed together. A template is traced onto the support wall in two places 180 degress apart (one cut-out only for small). The cutout provides built-in handle/s. Small($30.00) is the size that covers a wide variety of pets that range up to 20 lbs. Medium ($40.00) is for pets that weigh up to 50 lbs. Large ($50.00) is for pets over 50 lbs. For an additional $10.00 (7 character limit), your pets name can be inscribed by hand and my design onto the clay that was cut out for the handle and joined back to the wall but raised like a name badge. The bowls are dishwasher (top rack only) and food safe. They are made to order and from a lump of clay to your doorstep can take 3-4 weeks and during the holidays it could be 4-6 weeks because of workload. $10 for Shipping and handling. St.Louis area can save on S/H by reading here under delivery charges heading. 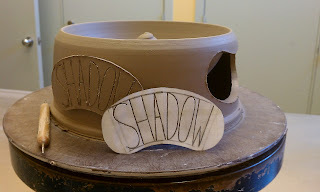 Have your dog's name placed on the bowl! Here is the timeline, sort of. June 5th I sent him the information. On June 13th he wrote letting me know that it was ready for the first firing. On June 22nd. It had been glazed and was awaiting a few more pieces being done before firing up the kiln. Quite a bit of work went into the making of this dish. Notice the center of the bowl? The bowl is designed this way to help slow down your dogs eating. Lewis designs the dishes 3 different ways. One is a basic bowl, the second is designed for dogs with long ears, and the last style is the one we received with the spire in the center. Each of these bowls also come in different sizes and colors. So you have a choice in both design and color. As you can see below, the spire in the center did slow Shadow dow some. She is the one who eats so fast sometimes she starts gagging. Now, obviously these would work for other pets too! And if you don't have a pet, Lewis also makes teapots and other decorative wares. Lewis has been working as a potter since 1994. He got his start in clay at Augusta University, where he received an Award for Excellence in Ceramics in 1996. Since that time he has moved to the St. Louis area to be around other artists. He has worked on items from miniature to larger scale pieces over 2 ft. tall. At the Fence is pleased that L G Potter was able to participate in our Pets on Parade event! He did mention that in a couple of months he might be able to do a giveaway! Disclosure:I received no monetary compensation for this post. I did receive a handmade Dog Dish for review purposes. All quotes in red come directly from the LG Potter website. All thoughts and opinions are my own. This Dog Dish is very nice and well for any dog. Using this dish you can serve any food to your dog and he/she can easily acquire it.